His long-time editor, Michael di Capua, told The New York Times the author died in Danbury, Connecticut, after complications from a recent stroke. He wrote some 17 books and was a prolific illustrator, but was best-known for his 1963 tale of Max, who became the "king of all wild things". It was made into a Hollywood film in 2009, directed by Spike Jonze. There have also been several other adaptations including an animated short in 1973 and an opera in 1980. The book, which became a children's classic in the US and sold more than 19 million copies worldwide, told the story of a boy who goes on a journey through his own imagination after he is sent to bed without supper. Considered controversial for its images when it was first published - which some claimed to have scared children - the book went on to earn Sendak a prestigious Caldecott Medal for best children's book in 1964. Born in 1928 and raised in Brooklyn by Jewish-Polish immigrant parents, Sendak said his own life had been clouded by the Holocaust and that the events of World War II were the root of his raw and honest artistic style. His childhood dream to be an illustrator was realised in 1951 when he was commissioned to do the art for Wonderful Farm by Marcel Ayme and by 1957 he was writing his own books. Other titles written and illustrated by the author include In the Night Kitchen, Outside Over There, Higglety Pigglety Pop! and The Nutshell Library. His last picture book Bumble-Ardy was published in 2011. It tells the story of an orphaned pig who gives himself a riotous birthday party. A posthumous picture book, My Brother's Book - a poem written and illustrated by Sendak and inspired by his love for his late brother, Jack - is scheduled to be published next February. The author won a number of awards for his work, including the Hans Christian Andersen medal for illustration in 1970 and the Laura Ingalls Wilder Award from the American Library Association in 1983. As well as writing, Sendak created costumes for ballets and staged operas, including the Czech opera Brundibar. He designed the Pacific Northwest Ballet's Nutcracker production that went on to become a TV film. 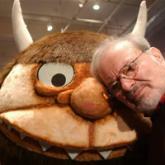 He also acted as producer on various animated TV series based on his illustrations, including Seven Little Monsters, George and Martha and Little Bear. President Bill Clinton also awarded Sendak a National Medal of the Arts in 1996 for his vast portfolio of work. Children's Laureate and author of The Gruffalo Julia Donaldson paid tribute to Sendak, saying his death was "a great loss". "I admired him just as much for his illustration of other author's texts as for his own work," she said. "Particular favourites being Mr Rabbit and the Lovely Present, written by Charlotte Zolotow, and Else Holmelund Minarik's Little Bear books. "His own stories tended to deal with quite powerful and scary emotions, but these were often alleviated by humour." She added: "I feel confident that his work will live on because it had such a timeless quality." In 2009 and 2012 US President Barack Obama read Where The Wild Things Are at the White House Easter Egg Roll. When asked whether the president had any comment to make on Sendak's death, White House Press Secretary Jay Carney said he had not asked, but was sure Mr Obama's two daughters had read the book. "I know every parent must be a little bit in mourning today and every child who grew up with that book. It's a sad day," he added.